If you're searching to increase your target audience into the fast-growing market in Eastern Europe, we have a perfect solution for your needs - the Eastern European datacenter, positioned in Sofia, the capital of Bulgaria. It has excellent connectivity options with all the countries in the area. By having your site there, you will not only enhance site loading rates for regional clients, you will additionally deliver a far better browsing experience. 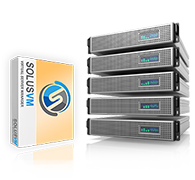 Тhis datacenter is available with all hosting packages, VPS and semi-dedicated servers.